This rolled sandwich is one of my go-to daily essentials. I used to make one daily for lunch when I used to work at a job that afforded little time to have a sit-down lunch. Even now, I am constantly on the move, and this little bundle of a lunch travels well. It also does double-duty for parties and entertaining: roll + slice = instant appetizers! 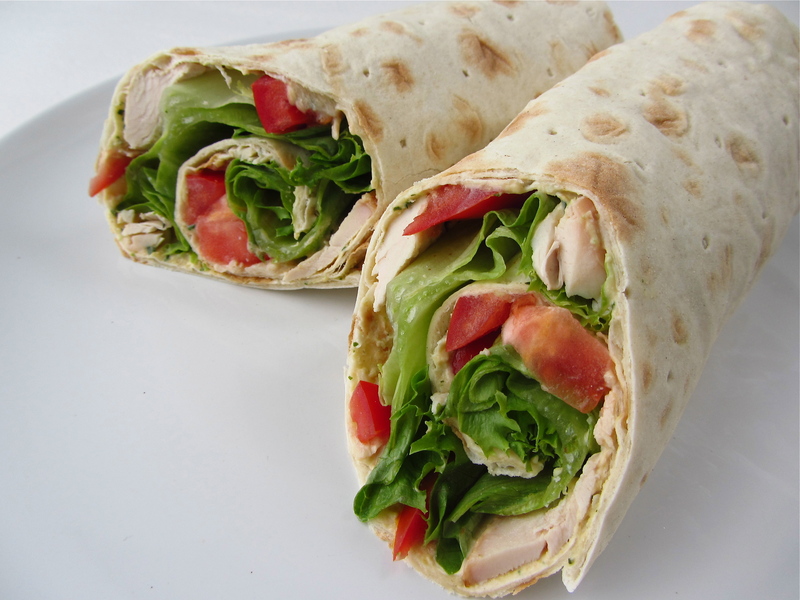 This sandwich wrap comes together in a matter of minutes. It requires a few ingredients and is very easy to make. Though, you can build it with whatever you want; if it can roll, it will work! So, whether in a hurry, going on a day-trip, too lazy to cook, or preparing a party tray, this little number is a real lifesaver. 1. Spread 2-3 tablespoons of hummus onto the lavash bread. 2. Thinly slice (or shred) the chicken, spread evenly over the hummus. Leave about an inch of hummus exposed at one end, it will help seal the sandwich when rolling. 3. Place a layer of leafy greens, and the tomatoes, over the chicken. 4. Starting at one end going toward the end with the exposed hummus, roll the entire sandwich together. * We all know about hummus; lavash bread also hails from the Middle East. It is fairly available in most markets these days. If you can’t find it, a large tortilla works too, though the flat bread has a better texture and flexibility for sandwich wrapping. * You can use deli sliced turkey or ham as well – it actually rolls better.